On page 94 of this book is a list of Captain Love's Company of Militia. Since James Crawford was listed as a lieutenant for the company, this list may prove useful to my Crawford research. By knowing the names of the various men in this company, I can search their pension records for mention of James Crawford (or any other Crawford). Have you used 'shared events' in your genealogy software? Michelle Simmons Lewis had a Facebook post today that is causing me to re-visit the concept of shared events. In her post, she indicated that she was using shared events to help with a one-name study in early South Carolina. I could be using shared events to tie the various members of my Kentucky FAN club together. Unfortunately, Michelle Simmons Lewis' post contained hints for Legacy Family Tree software and I use RootsMagic. Knowing that the software packages are similar, I looked for information on shared events in RootsMagic. I found a video by Bruce Buzbee explaining shared events in RootsMagic. Is something causing Ancestry's hinting system to merge people of the same name? I'm in the process of trying to disprove several Crawford men as the father of my James Crawford of Preble County, Ohio. Today, I'm trying to work on Rev. James Crawford (1752/3 to 1803) of Fayette County, Kentucky. I've found James Crawford [LZN5-SCD] in some of the Fayette County, KY records on Family Search. However, I have yet to find anything that would link James to his children. Thus, I decided to see if the Ancestry tree hints would help. I've had Rev. James Crawford along with several other Crawford families from early Kentucky in my tree for quite some time. Thus, I expected to find legitimate hints. Instead, I found a lot of hints for other James Crawfords, whom I also have in my tree. At first, I just assumed that other researchers had confused some of these Crawford families in their trees. However, when I looked at the hints for Ancestor Member trees, I realized that I was ONLY seeing member trees for a DIFFERENT James Crawford. Who Is this James Crawford? 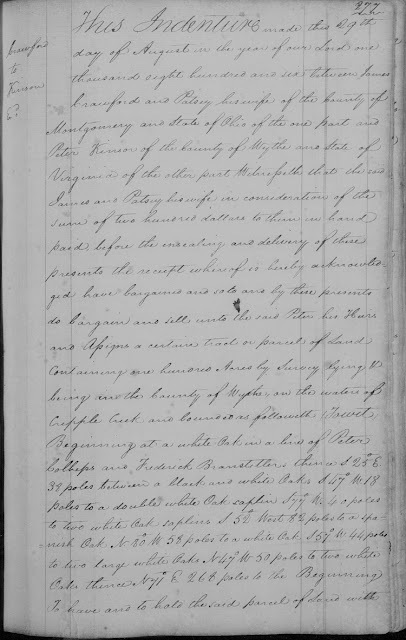 Have you ever run across a record in a county you've been researching and have no idea how the person in the record fits with known families in that area? Well, that's my situation -- and it is anoter James Crawford. James and Martha Crawford sold land in Barren County, Kentucky. Tax lists for Barren County show a James Crawford with 200 acres on the Marrowbone River. These tax lists also show another James Crawford with 50 acres on the Marrowbone. This second James Crawford is thought to be James and Sally (Smith Duggins) Crawford. 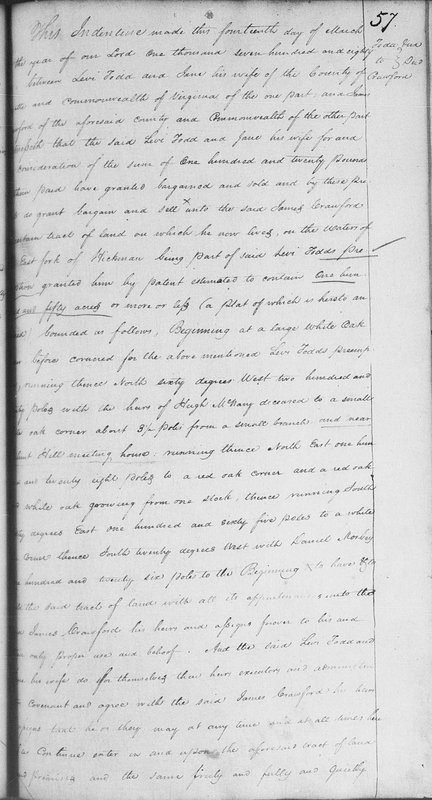 I've also identified the family of David Crawford who died in Barren County, KY in 1812. Now, I've found a deed for a James Crawford and Patsy his wife selling land in Wythe County Virginia to Peter Kinson. 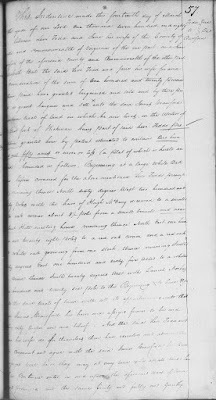 This 1806 deed indicates that James and Patsy were living in Montgomery County, Ohio at the time. I've seen several negative posts and comments about Ancestry's new DNA tool, ThruLines. I haven't come close to looking at all of my lines, let alone verifying them. However, I am thrilled Ancestry developed this new tool. Did I Find a Marriage Record? Marcia Crawford Philbrick. Powered by Blogger.